A custom branded website that fits your style, will grow with your business and speaks to your ideal client. Fully customized e-Commerce wholesale and/or retail shopping cart solutions combining WordPress + WooCommerce. Let me help you take care of your WordPress site by keeping it secure, updated & optimized, including some technical support. 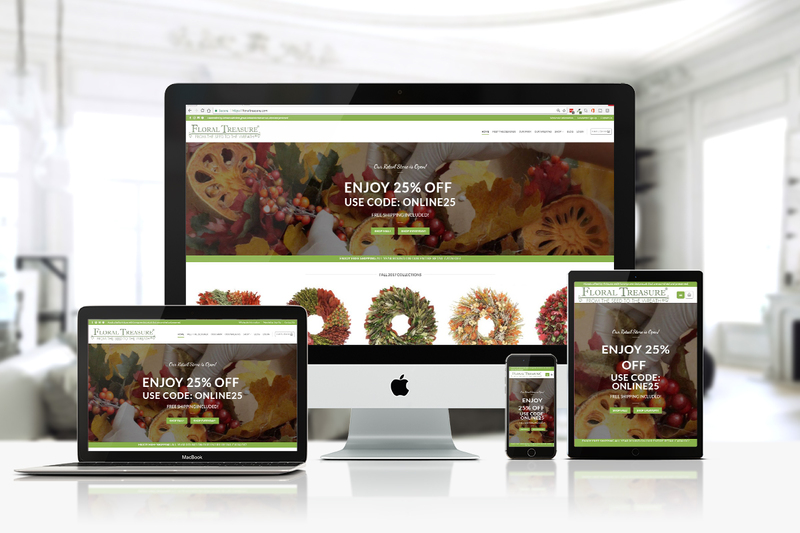 I work with independent entrepreneurs and small businesses to create professional & manageable WordPress websites that will uniquely feature your brand and/or product line (including E-Commerce solutions). I’d like to be your go-to person for all your website needs and take the “techy stuff” off your plate. I will personally work with you one on one from start to finish. My design experience goes back 16+ years of both corporate work and personal websites. My very first website was with Front Page in 2000 and it was for my wedding! We had company coming from out of town and I wanted so share all the logistics online to make it easier for everyone. Ever since, I felt a connection to design, code and usability. I fell in love with turning ideas into beautiful designs and easy to use websites. This was my calling. No matter the job in my corporate career, I always ended up in a creative role/technical role. I now run my own business doing this full time and have all the creative freedom my soul seeks. I take pride in what I do and can make almost any vision come alive through a design that is uniquely you. Read More. One for the public, accessible to all. And one for approved and logged in wholesale clients. This includes an online application process, a membership review and login system, different catalogs, viewing restrictions according to catalog & user who is signed up. A very robust eCommerce solution using WooCommerce, complete with inventory tracking, order system, reporting, wish list, etc… Her catalog is a must see :-). Nancy Tilelli is a Nutritional Coach who owns a healthy meal prep business in New Jersey. Her website goals were to feature her brand more uniquely to stand out from her local competition. Her site displays her as the owner front and center and invites her audience to dive into what she does and how to reach her. We featured some bright colorful images to highlight her personality, some split pages to break up her descriptions and incorporated a team section to bring home the personalized nature of her business. Nancy had her own logo, but we designed a signature text logo to go with it to make her personal brand more visible. This was a redesign project. Cecil was looking to re-brand to include his name and a more radiant, sunlit type website that would appeal beyond his current corporate audience. Vibrant & full of light, the layout is clean and organized and it highlights his services front and center. I designed this with Divi + custom code to achieve the desired flow. It includes email marketing with mail chimp, popup forms by Bloom from Elegant Themes, custom logo + graphics, as well as Adobe Stock photography, an interactive calendar plugin and a fully responsive design. SEO optimized & Google Analytics reporting installed. Your Beautiful Vibe is one of my most recent designs. A design with a touch of whimsical and white open space. A fully scalable layout with lots of room for ads or affiliate graphics. Included in this project: web design, custom graphics, text based logo, optin form set up and design, a blogging platform and flexible customer managed design layout alternatives. 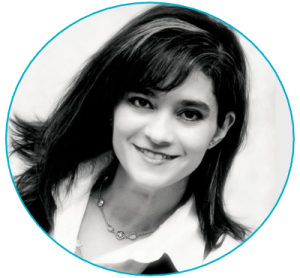 Jimena Lerma is a Holistic Nutritional Coach from Canada. 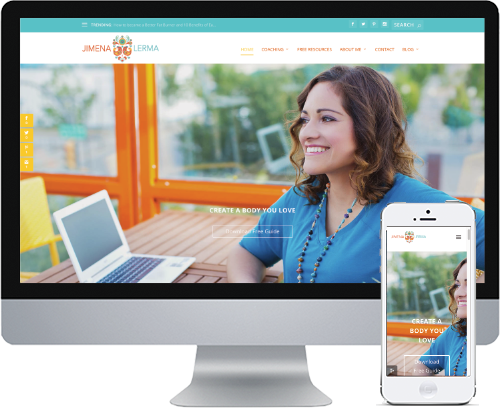 She wanted a website full of color and a touch of ethnic flare! 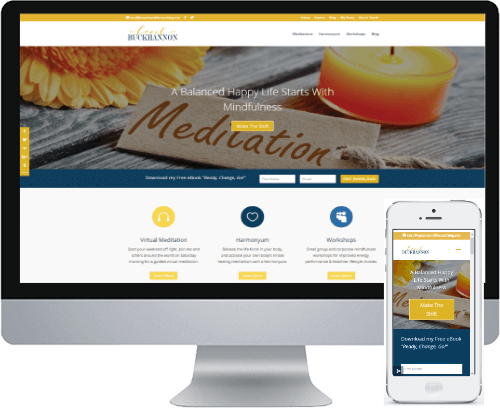 This design uses Divi with the Extra child theme which allowed us all the color diversity of the blog area in a easy to manage layout for her to maintain on her own later. Lots of things can be accomplished with CSS, however, updating CSS is not that simple for the average person. Extra did the trick! Her project includes a pop-up form through ConvertKit, lots of colorful imagery, business card design, logo design and an easy to use blog for her writing. “Amazing!! That’s how I’d describe working with Aymee. After spending months and months attempting (unsuccessfully) to teach myself how to design a website, I had nothing to show for it except frustration and a few more gray hairs. Then I was given Aymee’s contact info and encouraged to reach out to her. Well, after our very first phone conversation I knew I HAD to work with her to build my website/blog.